Alexandra Tyler is on the run. She married her college sweetheart, but soon discovered a dark side to him that she’d never seen before. Hoping to find refuge and start a new life, she moves to New Orleans. But bad luck follows and she finds herself barely escaping an abduction. Before she knows it, she’s entangled in the search for a serial killer. FBI Special Agent Danny DeLuca is on the trail of an infamous serial killer. There have been nine victims in nine months, one during each New Moon. But the tenth victim, Alexandra Tyler, escapes, giving Danny the first break he’s had in the case. His job is to protect her and catch the killer, but as danger closes in, Danny must guard his heart in order to keep her safe. While the killer continues to commit the almost perfect crime, Danny and Allie are forced to work together, while also resisting the other’s charms. If they give in to their escalating attraction, it could be the death of both of them. Alexandra Tyler lay in bed and stared up at the ceiling fan. It rotated slowly, catching the pale light that seeped through the curtains of her apartment in New Orleans’s famous French Quarter. She’d been prescribed sleeping pills but they hadn’t helped, plus the headache and hangover that came with them were punishing. She pushed the coverlet away and got up. According to her phone, it was just after two a.m. She’d been trying to sleep since eleven. Setting the phone on the coffee table in the living room, she stepped through the casement windows onto her tiny balcony. She sat on a beach chair and breathed the cool night air. The lights from Bourbon Street made a neon rainbow in the sky and even from three blocks away she could hear the shouting and laughter. For a moment, she considered walking over to the infamous street and letting the giddiness of the party that never ended distract her from the terrifying memories from two weeks before. But Bourbon Street was a little more depressing than fun these days. The seedy bars showed their advanced age and the après-prom kids, tourists, and drag queens wandering up and down at this hour were either too old or too young to be doing what they were doing. She sat on her little balcony rubbing the sore places on her wrists and doing her best not to think about those awful moments when she’d been grabbed and slammed into the side of a van, then trussed and thrown inside it. It wasn’t surprising she couldn’t sleep, not when the nightmare haunted her twenty-four seven. She smiled wryly. She’d come to New Orleans to start over. And she had. She loved her little apartment that looked out over Royal Street. She loved being a window designer. She loved how strong she had become since she’d moved here, both physically and mentally. Most of all, she loved that she no longer lived in fear, at least until two weeks ago. Two weeks ago, she’d escaped an abduction. She’d been bruised and scraped but that was all, physically. Mentally, emotionally, that was a different story. She knew of only one person in her life who would have cooked up such a scheme—her ex-husband. But why? And why now? The police had been helpful and concerned, especially Detective Gautier, and had promised her they would check out her ex-husband, but she could tell they thought the incident, while serious, had been random. Through the casement windows, her phone pinged, announcing a new text message. She started, her pulse skittering. She was terrified that she knew who was texting her. She’d thought it was over, but she should have known it wasn’t. She was so tired. “Please be an ad from Home Depot,” she whispered. She went inside, not looking toward the coffee table. With a deep breath, she walked toward the bedroom. She’d ignore the phone and go to bed. But at the bedroom door, she braced herself and turned around. Her hand shook and dread spread through her like a chill as she picked up the phone and swiped the screen. Hi, Sugar Pie. Don’t you love New Orleans? Let’s meet for beignets one morning. Her knees buckled and she flopped down on the couch, pressing her hands against her chest, trying to stop the panic that crawled up her throat. This was the third text she’d received, and the most ominous. The first two had been more generic, though still disturbing. She’d told herself it was spam, but she’d decided not to delete them, just in case. And now she knew. This text was not spam. It was from Gary. Her worst fear was realized. He had found her and he was here. FBI Special Agent Daniel DeLuca sat in the elegant desk chair in his room at the Monteleone Hotel and looked out at the neon lights shining from Bourbon Street. He’d heard about the debauchery, glitter, and madness of the famous street, but he’d assumed the stories were exaggerated. It was hard to imagine such a place in the United States. Amsterdam—sure. Certain areas of Paris or Madrid or Rome, yes. But not in Louisiana, one of the deepest parts of the Deep South, which had never quite recovered from the ravages and divisiveness of the Civil War. He’d just flown in to New Orleans from DC after a grueling week of testimony before Congress. The director had been the one testifying, but Danny was part of the team researching the subject matter, preparing answers and being on call on Capitol Hill for instantaneous information as needed. Prior to that, he’d been in San Antonio along with another agent during the new moon, a disappointing effort as it turned out. So now here he was in New Orleans, nearly two weeks too late and exhausted. He’d come here to investigate a possible survivor of the serial killer his team had been chasing for months. Two of the team members were in San Antonio while one, Management and Program Analyst Christine White, was working from Quantico because she was very, very pregnant. He thought about walking down Bourbon to see what all the music and laughing and shouting were about. He was too antsy and excited to sleep. Tomorrow morning he had a meeting with the local supervisory special agent in charge of the New Orleans FBI field office, Adam Laroche, to be briefed on an attempted kidnapping case. Danny couldn’t wait to hear what Laroche had to say. He hoped with every fiber of his being that this victim who had evaded abduction was the lone survivor of the serial killer he’d been chasing for all this time. The behavioral analysis unit had been assigned to the case after the third victim had turned up. The unknown suspect’s modus operandi was the same in each case. He abducted his victim during the new moon phase of the moon, and killed them, usually within three days. His preferred site for disposing of the victim’s body was near their home or job. It was unknown how he had managed to successfully overpower and murder healthy adults nine times without a mistake. Nine victims in nine months, and Danny had little more information on the unknown subject or unsub than when he started. The FBI had not yet developed a consistent victim profile and the geographic pattern was atypical to say the least. But now, at last, they might have their best chance yet to identify the person. They had an eye witness—a victim who had escaped the killer’s clutches. It was about time. Despite the FBI’s best efforts to hide the nature of the crimes, a national news journalist had noticed that several recent murders had happened during the new moon. The journalist had felt an obligation to alert the public to a possible serial killer and, of course, make a name for himself. He dubbed the mysterious murderer the New Moon Killer. And true to form in serial murder cases, word about the New Moon Killer had started to spread. The FBI had worked diligently to staunch the coverage, and had spent some time talking with the journalist. Soon after, the excitement over the case had waned. Danny rubbed his burning eyes and blinked to focus on his phone. It was almost three o’clock in the morning. He really needed to sleep. He’d spent most of the evening looking for a store that had white boards and dry-erase markers so he could make notes about clues and evidence gathered on this latest victim. He was due at the New Orleans FBI Main Office in six hours, to be briefed on the woman who may have barely escaped being the tenth victim of a nameless serial killer. Had his unsub finally made a mistake? Danny picked up the slimmest file of the stack he’d set on the desk. So far, it held the newspaper clipping from the New Orleans Journal about Alexandra Tyler’s near kidnapping, two pages of background information he’d dug up and the copies of the police reports from the eighth district of the New Orleans Police Department, who’d caught the case. Right now his profile of Alexandra Tyler was consistent with the other nine victims, mostly in the fact that it was peculiarly unrevealing. Each victim had been a normal person, with a normal job and family life. There was only one major difference. Nine victims were dead. Ms. Tyler was alive. Even her history with an abusive ex-husband was not entirely atypical. Three of the victims had been divorced. Two had had a history of moving and changing jobs. He wrote the list of victims on one of the white boards, which he had set upright on the desk where he would see it first thing in the morning and last thing at night. He kept writing until he started to grow sleepy. He sat on the bed, propped up by pillows, opened Tyler’s file, and began reviewing it for probably the thirtieth time. Four hours later, Danny woke to a pinkish glow coming in through his window. The sun was about to come up. He glanced at his phone. Seven a.m. central time. His meeting with Special Agent Laroche was in two hours. He got up and collected the scattered pages of Alexandra Tyler’s file off the bed where he’d fallen asleep while looking at them. With a last, longing glance at the bed, he headed for the shower. 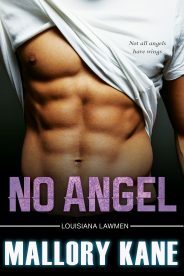 Did you know that No Angel and many titles are available digitally from Tule's own bookstore? Check it out!